The modern society man spends very little time taking care of his health. We barely exercise and the vast majority of jobs pins us down to a chair in front of a computer. In simple words, we spend a lot of time sitting down at the office and sitting down at home. This can have a heavy toll on overall health. The most common problem that people complain about is neck pain. This problem is the most frequent one mainly because of the long hours spent in a chair in front of a computer. It would be nice to get a massage every day when getting home but it can be a burden for the one giving the massage. The solution is to get a neck massager. Technology made it extremely simple to deal with neck pain while helping the user relax a bit. without further ado, here are the top 10 best neck massagers in 2019. 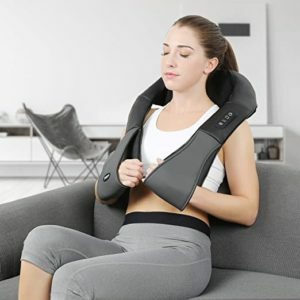 AMEISEYE neck and shoulder massager has the ability to soothe muscles and provide a genuine massage. It is a simple massager that is meant to be used around the neck. It has a heating function that warms up the area. The model has 3 massage speeds and can change the direction of the motors rotating inside. In terms of safety features, the massager has an auto shut-off function after 15 minutes. Inside the kit, users will find an AC adapter, a car adapter, and the user manual. A massager is a great option even for the ones that suffer from chronic pain. It has an efficient design and simply works well. The biggest problem with it is the stitching. While it looks good, it will not survive if the armrests are pulled hard. 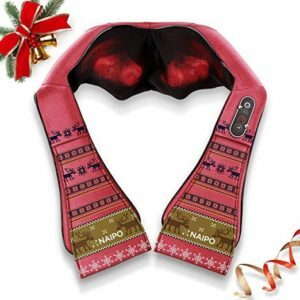 Naipo neck massager is a good pick for the ones are looking for something simple that just works. The massager has a simple construction with 3 elements that rotate in either direction. The rotation speed can be adjusted and the heat function can be switched on or off. In terms of build quality, the massager is made out of leather and has two arm supporting straps that surely improve comfort. To power it, the manufacturers added a regular AC adapter and a car adapter. The heating element is not very powerful. There is no option to adjust the heat setting which means that it always runs with the same heat no matter what. If it was decently warm it would have been no issue but the massager only warms up to about the normal human body temperature. 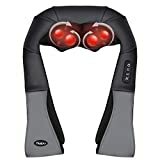 1byone neck massager is an ideal pick for the ones that are looking for a good deal. It works the same as all other massagers but it is much more compact. It was designed to be used when working as it is supposed to be supported by the back of the user and the chair. The model has a heating option that can be switched on and off can be set to rotate in either way. For safety reasons, the massager will turn off after 20 minutes. Inside the package, the manufacturers added a car adapter along with the regular AC adapter. 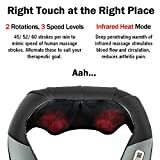 If there is one feature that should not be missing from any massage device is the adjustable speed. 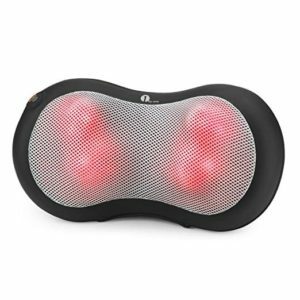 The 1byone massager cannot have its speed adjusted. 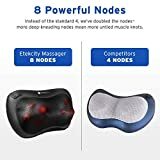 If the heating option would have been replaced with the ability to change the speed of the rotating nodes, the massager would have received a much better rating. 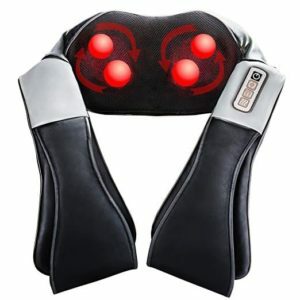 Nekteck shiatsu neck massager is an excellent option for the ones that spend a lot of time in a chair at the office. The model is quite similar to the models we have seen so far. It is made out of leather with a mesh material on the part that touches the neck. The rotation of the massager can be reversed and offers three speeds. The bottom strings can be used to hold the arms of the user. Like most other massagers on our list, the complete kit includes the massager, an AC adapter, and the user manual. The device uses rotating balls to massage the neck area. For unknown reasons, the manufacturers decided to go for balls that are made out of hard plastic. 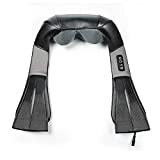 This makes this particular neck massager rather uncomfortable especially for the ones that do not tolerate pain at all. HoMedics NMS-375 is one of the most inexpensive neck massagers on our list. It has a simple design that makes it look like a neck pillow. 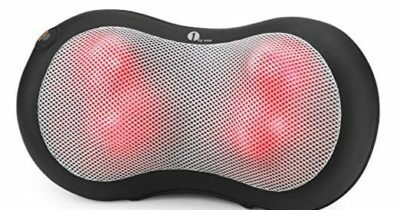 To help relax the muscles, the HoMedics uses vibrations. 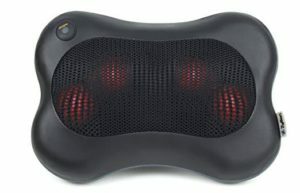 It can also combine shiatsu with vibrations to offer a more relaxing massage. One big advantage is that the massager is quite compact. It has two straps that the user can use to pull and apply more pressure while the overall build quality is quite impressive since it is mostly made out of leather. Most people will have no problems at all using the massager. The ones that have a thicker neck will be surprised to find out that the massager is just too small. On some, it will be a bit tight while a small fraction will not be able to use the massager at all. 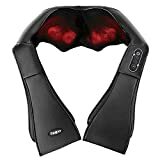 VIKTOR Jurgen shiatsu neck massager is a good pick for the ones that need something simple. 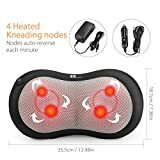 It is a neck massager with a heating option and a safety feature that turns off the unit after 15 minutes. Because of its design, the massager can be used at home but also at the office. To massage the neck area, the model uses rotating plastic balls. The rotation is reversible and the speed has 3 levels. Last but not least, the massager comes with an AC adapter and a car adapter included. The heating function is useful if it would get warm enough. Just like most other massagers on our list, the heating is not adjustable and can only be switched on or off. When switched on it barely gets as warm as the normal human body temperature. 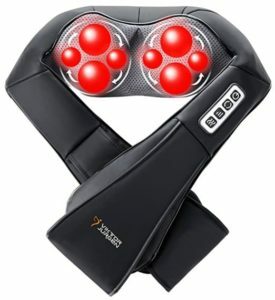 FIVE S FS8801 neck massager is a good pick for pretty much everyone. The massager uses small plastic rollers that rotate to help relax the muscles. The rotation speed and direction can be adjusted while the straps for the arms can be used to apply more pressure to the neck. In terms of protection, the model has an auto-off function. Construction is also quite good as it uses mostly leather and a bit of mesh on the surface that touches the neck. Like most of the other models on our list, it comes with an AC adapter and a 12-volt car adapter. The rollers used for the device are made out of a plastic material. It is fairly hard and if too much pressure is applied it can become unpleasant or even painful. This can happen when the arms are resting on the straps of the massager. It is better not to apply too much force to pull down on the massager. 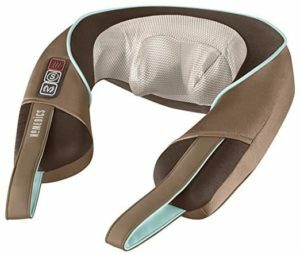 Etekcity shiatsu and neck massager is an excellent option for the ones that like to take the massager with them. The model is very compact but it manages to cover the entire neck area. It has 8 rollers that can rotate in two directions which help the muscles relax. The model comes with a heating option that can be turned on or off and a protection mechanism that turns the massager off after 20 minutes. 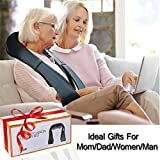 Last but not least, the massager features multiple adjustable speeds and comes with a strap that makes it possible to attach it to a car seat. The manufacturers state that it can be used for back massage as well but this will prove to be nearly impossible. Regardless of the position of the user, the back will be pressing down onto the massager. As the rollers are made from a hard material, it can become painful to lean on the massager. 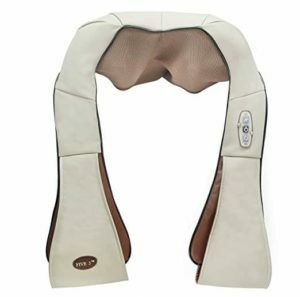 Naipo shiatsu back and neck massager is quite similar to some of the other models on our list. It has the same leather construction and holders for the arms. The model can be used for back and shoulder massage. It has 4 control buttons on one of the arms that allow the user to select one of the 3 massage speeds, rotation direction and turn the heat on or off. The model turns off automatically after 20 minutes of continuous usage in order to prevent minor injuries. In order for someone to use it as a back massager, they will need to lean on it. Sadly, the hard plastic rollers will make it rather uncomfortable or even painful. It is better if the massager is used only for the neck area. 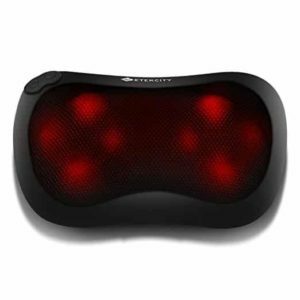 The Zyllion ZMA13BK is a good neck massager that comes with a compact form factor and a great build quality. Unlike other massagers, this one uses 4 rollers that are a bit softer to the touch. Being a small and portable massager, it has been fitted with a strap that can be attached to a car seat. It also includes a car adapter and an AC adapter. The model will switch off after 20 minutes of continuous use in order to prevent hurting the skin in the neck area. The rotation speed of the massager cannot be adjusted. Most other models in our list have 3 speeds and can have the rotation changed. The Zyllion is more of a basic model that was made to be inexpensive and work for as many people as possible. Number of rollers: The number of rollers oscillates between 4 and 8. The ones with 8 rollers offer a different experience because these rollers are smaller. They feel a bit smoother. The models with 4 rollers are a bit rougher. Heating: A massager that can heat up properly to a reasonable temperature is a true blessing. Sadly, most of them barely warm up to the temperature of the human skin. This is because of safety reasons but it is also not enough to provide that warm, soothing sensation.